The name "Dominator" may be associated in many enthusiasts' minds with a great Norton model of the past, but in the case of its latest user, the Honda NX650, it is well merited. Thirteen years after the launch of the 1975 Yamaha 500XT, the specification of the Honda NX650 Dominator brought fond memories of that two-wheeled icon. 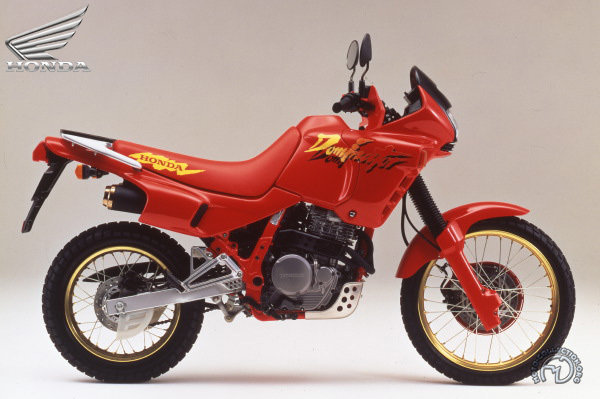 Honda launched its renowned Dominator in 1988. A very modern "grassroots" trail bike, it recaptures the original spirit of this type of two-wheeler: character and versatility. Abandoning the broad-hipped styling of the "ship of the desert" machines, the Dominator's smaller format endows it with safety and sure-footedness on all terrains. Its remarkably well-balanced frame is equipped with excellent suspension and outstanding braking. A classic 644cc air-cooled four-stroke with a single overhead camshaft operating four radial valves, the Dominator combines a sparkling personality with torque, power and liveliness right across its power curve, to such an extent that it has become a point of reference for enjoyable riding qualities. Underwritten since its launch by its sound commercial success, and esthetically retouched for 1992, the Dominator has become the gold standard of a category that it truly dominates. The striking lines and outstanding handling of the Honda NX650 certainly justify its right to be called "Dominator. "